On January 29 nineteen IFFCO workers were acquitted in a Suez court of 'inciting' a strike after the company filed criminal charges and security forces descended from a fleet of 50 vehicles to swoop down on the Suez factory where workers were conducting a peaceful sit-in over the grossly unfair distribution of a much-needed end-of-year bonus. Among the defendants were the President and General Secretary of the independent IFFCO Egypt Labour Union, which has faced permanent management hostility since it was legally established in 2011. While the court has cleared them of criminal charges 17 IFFCO workers including the union President, Vice-President and General Secretary are barred from returning to work. As part of the ongoing management campaign of harassment and intimidation so-called 'damages' allegedly resulting from the sit-in have been deducted from workers' wages. 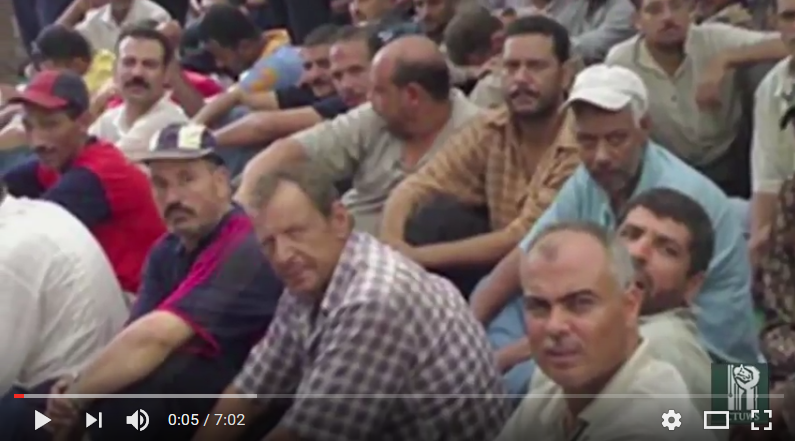 CLICK HERE to see the new video produced in solidarity with the IFFCO workers by Egypt's Center for Trade Union & Workers' Services (CTUWS).